Skin bleaching can be a great confidence booster and has experienced a surge of popularity in many communities around the world. Often, skin tone is considered an indication of beauty and this is evident in many countries where high numbers of the population choose to bleach their skin. This is from the widespread idea that lighter skin equals beauty and success. For those with darker skin, skin-bleaching is seen as a pathway to future and career success. However, while skin bleaching is great for some, there is certainly an exception to usage that should always be taken into consideration. The process of bleaching can come with a range of consequences, so it is not recommended for everyone. If you have certain skin conditions, those outcomes can be more severe and prevalent. As such, it is definitely not advised to use bleaching and lightening products when the following skin conditions are present. Before diving into this topic, let’s define skin bleaching. What exactly is it? The process of bleaching is a popular method to whiten and lighten the skin through the use of different creams and products. The products use a combination of ingredients to help with lightening the skin tone after frequent exposure and continued use. Many users report achieving desirable results after using the products. However, others have reported adverse outcomes. It is those adverse outcomes and who should avoid it that will be addressed in this article. A recent study in Senegal documented the adverse effects of skin bleaching, predominantly for those with pre-existing skin conditions. It documented bleaching as a public health problem in that country. This is largely due to the number of people who choose to utilize bleaching products despite persistent warnings and knowledge of the risks if they have certain skin conditions. There is no question that the process of bleaching is not for everyone—and that is perfectly alright! If you are concerned about your skin and its reaction to bleaching products when combined with certain skin conditions, keep reading. One of the main causes of irritation from bleaching products arises from the ingredients. There are some products that are safe for skin, but there are others that still utilize chemicals that are not friendly to the skin. This is especially if you already have certain skin conditions. Most skin bleaching products use harmful chemicals like hydroquinone, steroids, mercury, and tretinoin. The presence of one of these chemicals or a combination of multiple can lead to the adverse effects detailed later on. Steroids lead to hormonal imbalances. These imbalances can cause issues with mood and stress level, difficulty sleeping, headaches, and more. 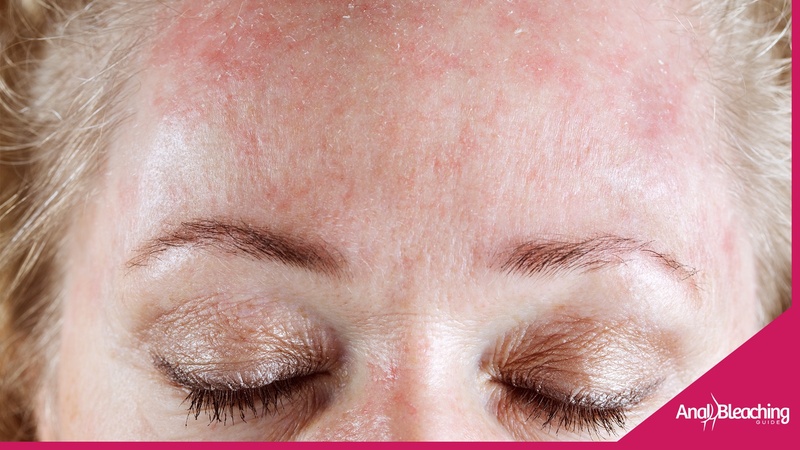 Hydroquinone can result in a burning sensation and overall skin irritation, which is further exacerbated when certain skin conditions are present. Mercury should not be used over an extended period of time as it can lead to poisoning. It can also cause liver and kidney damage that is sometimes irreparable. Unfortunately it has been found in some non-reputable skin whitening creams, this is why it is always important to use a quality lightening cream. Tretinoin was originally used for acne treatment. But researchers now know it can have harmful effects when combined with the other ingredients on this list and when used in excessive amounts. This is not to say all bleaching products are unsafe. Not all products are created equal and some do use gentle and safe ingredients, like Amaira. This is where the importance of research comes into play. Maybe you are thinking about taking the risk, regardless of the skin conditions listed below. But before you dive in to see if your condition makes the list, take into consideration the potential outcomes. Sure, everything could go just right. In an ideal world, you could achieve the perfect shade of skin you set out to achieve. However, under certain circumstances that will not be the case. This list is not comprehensive, and there may be other effects of bleaching not listed here. Of course, not everyone has any or all of these symptoms. But these outcomes are likely if you have any of the skin conditions listed in the next section. As discussed, bleaching products use some strong chemicals. Sometimes the combination of those chemicals does more harm than good when used improperly. According to the study from Senegal, women with acne experienced worse skin conditions after whitening. This is due to the irritation caused by the chemicals and the burning sensation experienced after using bleach. Acne is not compatible with skin bleach and is not advised. Dermatitis is defined as an inflammation of the skin caused by a variety of factors. There are also different types of dermatitis. One of these types is contact dermatitis, resulting in nummular, or pink and red rashes. The nummular produces red plaques about the size of coins and other issues. Skin with dermatitis can be itchy as well as a combination of dry and flaky or greasy and weepy. Dermatitis is caused by a range of factors. The symptoms only get worse after exposure to dangerous chemicals. It stands to reason that issues with skin inflammation will only be further irritated by the harsh ingredients in bleaching products. People with dermatitis should not use lightening products. Eczema is a medical condition where patches of skin will swell, redden, itch, crack, and roughen over time. These symptoms result because the dermal cells are unable to retain the necessary moisture. The lack of moisture leads to inflammation, which leads to itching. The cause of eczema is unknown. Typically, those with eczema share common traits such as hereditary or hormonal factors and environmental factors. Some irritants for eczema include chemicals, like those found in bleaching products. Irritation can also come from sudden temperature changes and microbes. Often, the chemicals in scented products can also act as irritants. This condition is aggravated by stress. Since eczema is irritated by the chemicals found in bleaching products, it is not advised to use bleaching products when you have eczema. Additionally, some bleaching products use steroids that lead to hormonal imbalances. Hormonal imbalances can further spur eczema because they lead to increased levels of stress and anxiety. On top of being irritated by the products themselves, the eczema is likely to worsen due to the stress caused by the steroids. Allergic reactions are another reason not to use skin-bleaching products. There is always the risk of further aggravating the symptoms. This is not limited to having allergies to the actual products but expands to include common allergies, like nuts, trees, foods, and more. For example, if you are allergic to nuts and accidentally ingest them in some form, the allergic reaction looks different when you are using bleaching products. Whereas the reaction may subside after one antihistamine drug if you accidentally consume it, there might need to be more antihistamines if you are using bleaching products. This is the because the ingredients create more sensitivity in the skin. This is further aggravated by the allergic reaction. Allergic reactions can lead to inflammation, increased sensitivity, swelling, and other skin issues. Additionally, it is plausible to develop an allergic reaction to the bleach itself and the ingredients found there. This allergic reaction may present itself in much the same way, resulting in inflammation, irritation, and other issues. Either way, if you anticipate or have had an allergic reaction to bleaching products, do not use them. Before using potentially harmful products, especially if you have any of the skin conditions listed here, do some research. Know what you are putting on your body before you actually do it. These conditions can range from mild to serious, and as such, so can the outcomes. It is also important to recognize and understand this is not a complete and comprehensive list of skin conditions. These are just four common skin conditions. If you anticipate adverse effects or experience any after using bleaching products, consult your doctor, dermatologist, or another licensed medical professional. The goal of bleaching products is to achieve a desired shade of skin, but it should not be done at the expense of your health and well-being. You don’t want to stress out your skin and not even achieve the outcome you hoped for! Always prioritize your health and use skin-bleaching products safely. If you want to know more about how to safely and properly whiten your skin, check out this page.